Which comes first – the apps or the business? It might sound like a dumb question, but the consequences of building a business on the wrong software tools can be serious. What if your customer database can’t talk to your accounting system? Or your resource planning is in chaos because everyone’s using different project management systems? You really don’t want to be recreating core systems while your team is trying to build the business. Your CRM system will be at the heart of your business from day one. Pick a solution that will scale as you grow and integrate seamlessly with other core systems like marketing automation, helpdesk, and accounting. Salesforce achieves this through its ecosystem of applications, the AppExchange, making it easy to use as your customer master data management system. 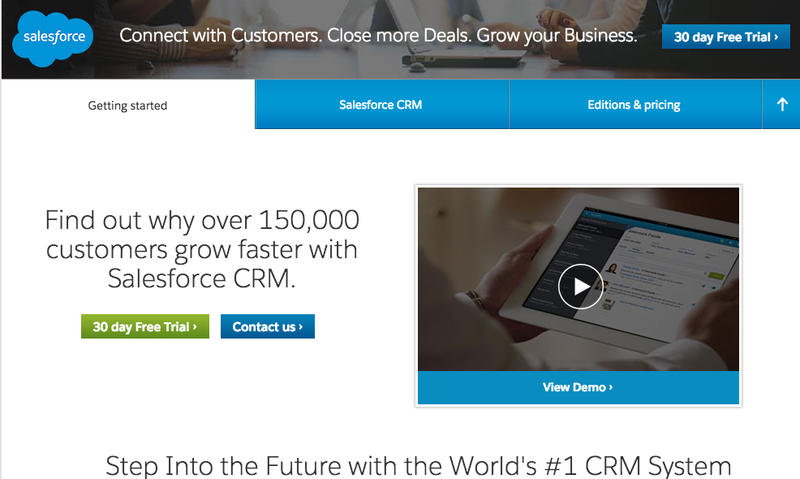 Salesforce is the de facto standard in CRM, so your salespeople will know how to use it. This is important, because you want your people out there selling, not learning how to use a piece of software. But, if you do choose a different solution, make sure it supports REST APIs so you have the flexibility to plug in third-party apps. Alternatives: SugarCRM starts at $40/user/month for a slightly more advanced solution than the Salesforce starter product. Netsuite CRM+ is part of the Netsuite cloud-based solution that also encompasses ERP, project management, and e-commerce and is more geared to mid-sized businesses; pricing starts at $129/user/month. 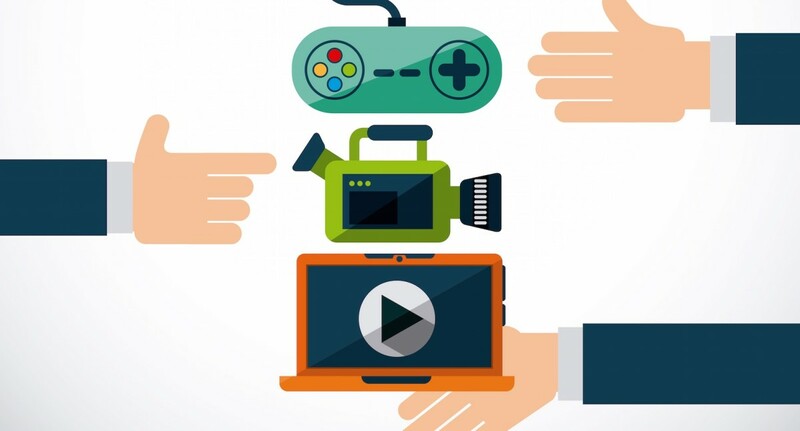 There are two major challenges with selecting a marketing automation system. First, you build up a lot of data very quickly – email campaigns, landing pages, ads, databases, hundreds of thousands of records – which means that switching solutions down the road will be extremely cumbersome. Second, you need a solution that’s appropriate for and accessible to startups – not one that’s designed for a Fortune 500 enterprise with a budget to match. For most early- to mid-stage startups, HubSpot will hit the spot. It’s scalable, plugs into Salesforce, and has all the functionality needed now and into the future at an accessible price. Alternatives: Marketo starts at $895/month for 10 users and up to 10,000 contacts. Pardot is Salesforce’s own marketing automation solution; pricing starts at $1000/month for up to 10,000 contacts. 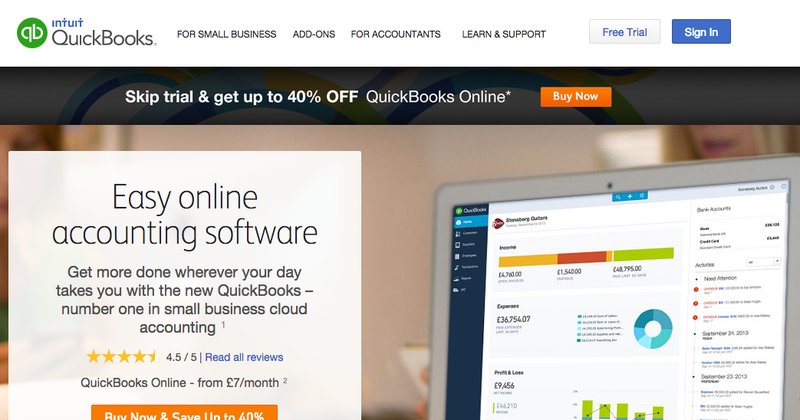 Like almost every other startup in the country, QuickBooks is the way to go. Like Salesforce, it’s the de facto standard. Every bookkeeper and CPA knows how to use it, and that is key for the way startups tend to work with evolving accounting needs. Startups often shift around from external financial consultants, fully outsourced accounting groups, and in-house finance teams. At no point will any of these groups look at you like you are crazy for choosing QuickBooks, and this will save you time and trouble moving forward. Sure you will hit a point in which you will need to migrate to a more robust system, but ride out the Quickbooks $35 a month train as long as possible. Alternatives: Xero starts at $9/user/month and scales to $70/user/month for the premium product. FreshBooks ranges from $9.95 to $39.95 per user per month, but you’re likely to hit an expansion wall earlier in your growth curve. Netsuite also offers an accounting module, but it’s likely to be overkill for a startup. This should be an easy choice. With Google, you get a powerful email system that’s protected by robust two-factor authentication to keep your sensitive data secure. There’s a full suite of Microsoft-compatible productivity apps, and extensive support for collaboration that’s simply not possible with a desktop suite. 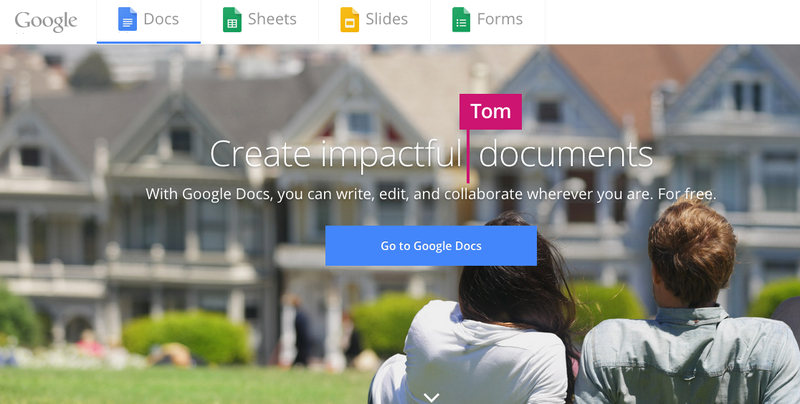 When everyone can use the same master templates and easily clone documents or presentations, it’s much easier to present your business professionally. The last thing you want is for every salesperson to have a different version of your sales deck stored on their computer – that’s a recipe for brand dilution and lack of professionalism. Alternatives: Microsoft Office 365 starts at $5/user/month; extra fees apply for business-class email and other business services. While there are a number of other cloud-based productivity suites, most lack an integrated email client, limiting their usefulness as a comprehensive solution. Closely allied with collaboration is project management. Most businesses tend to start with spreadsheets. As projects become more complex, companies often graduate to tools like Basecamp, Sprintly, and Asana. But in no time, development projects will inevitably face business dependencies and vice versa, so determining a centralized platform is key. Projects don’t happen in bubbles, and the last thing you’d want to do is duplicate data or lose perspective and efficiency. 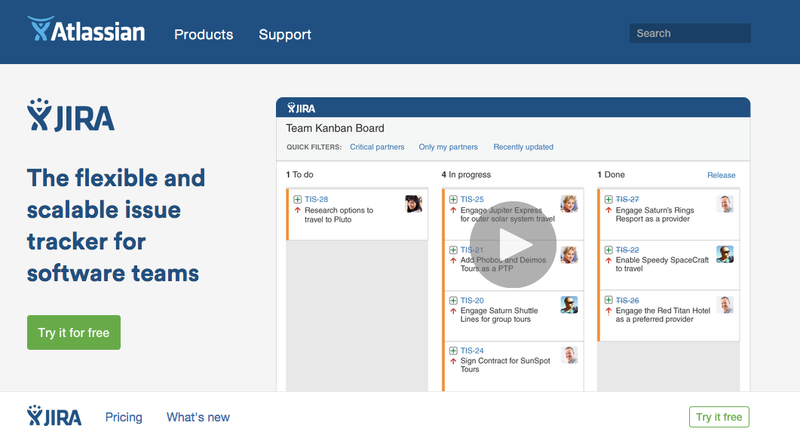 JIRA is a broad-based tool that gives cross-departmental project management and provides every employee insight into what others are working on. It acts as a triage tool to focus on what’s important while keeping up with deadlines, and also serves as an excellent bug tracking system. Alternatives: Basecamp starts at $20/month and 3GB storage and tops out at unlimited projects for $3000/year with 500GB storage (all prices are for unlimited numbers of users). Asana starts at $21/month for 5 users, and Sprintly starts at $19/month for 6 users and 12 “observers”. Your startup will absolutely need a central code repository. If your engineers are not collaborating, development will quickly turn into the wild West. This is essential even when there’s only three people in the company because if there’s no collaboration, something will get broken. GitHub addresses all of these challenges. Alternatives: Bitbucket from Atlassian, developers of JIRA, is free for up to 5 users, $10/month for 10 users and $200/month for unlimited users, all with unlimited private repositories. GitLab starts at $39/user/year for 10 users. A functional real-time messaging platform is key, especially when you’re in the really early stages. Slack is a standalone tool that integrates nicely with other tools and services. Startups would do well to consider Slack channels for every office, special project, event, and business department. Alternative: Bitrix24 is free for the first 12 users, but the 5GB of storage will be eaten up quickly; the standard version for unlimited users is $99/month and comes with 100GB. Hipchat, also from JIRA developer Atlassian, is free in its basic version and $2/user/month for the paid version. Cell phones quickly becomes unmanageable as a business system when you need to transfer calls between people and present a standardized image to the outside world. They don’t scale with the company, reception is unpredictable, and phone numbers are tied to individuals, not the company, which can cause big problems when someone leaves. 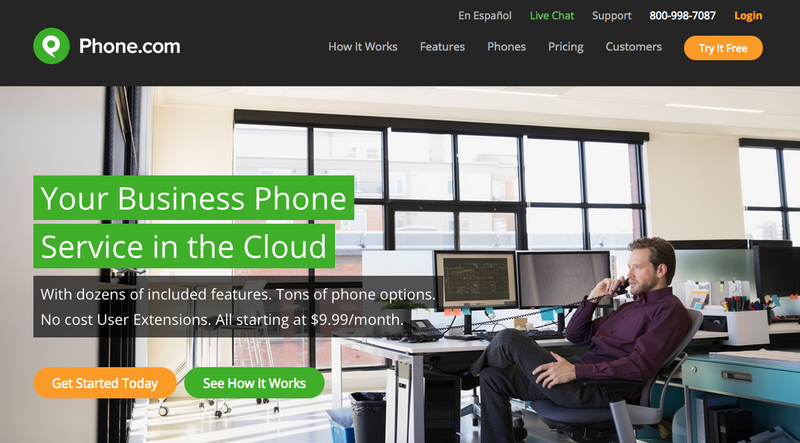 Phone.com offers a robust system that’s accommodating to user control. It is easy to set up and comes with a VoIP app for cellphones as well as integration with Polycom conference phones, offering complete flexibility. The hardware is excellent quality, the cost is predictable for each new hire, and it’s all on one scalable platform. Alternatives: RingCentral has a similar base pricing model but may get more expensive as you scale. Via:Talk uses a minutes-based pricing model: $34.95/user/month for 1500 minutes, or $42.95 for unlimited minutes. The world has changed since we started out, and it will continue to change. So I’d like to leave you with one final thought as you begin to build out the technology base of your business – plan for security and manageability. It’s not glamorous, but it is necessary. Ten or 20 apps plus 10 or 20 people equals anywhere from one hundred to four hundred username and password combinations. Which is one hundred to four hundred possible entry points for hackers to get at your code, your customer database, your finances, you name it. So be sure you have two-factor authentication and an identity management system like Bitium or OneLogin in place before you open your doors to the world.